Info "Paint those nails and make 'em pretty! Pink is the new mauve!" 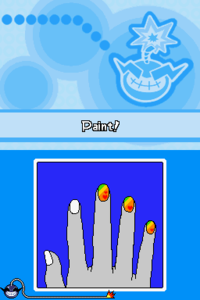 Finger Painting is a microgame found in the Ninja Scribble stage in WarioWare: Touched! When starting the microgame, the word "Paint!" appear on the screen, telling the player to do so. The objective of the game is to paint the unpainted fingernails by scribbling over them completely before the time runs out. If the player does so, the game is won. 1st level difficulty: There are 2 fingernails to paint. 2nd level difficulty: There are 3 fingernails to paint. 3rd level difficulty: There are 4 fingernails to paint. This page was last edited on July 25, 2018, at 13:22.